Download a blank fillable Dd Form 2656-10 - Survivor Benefit Plan (Sbp)/reserve Component (Rc) Sbp Request For Deemed Election - April 2009 in PDF format just by clicking the "DOWNLOAD PDF" button. 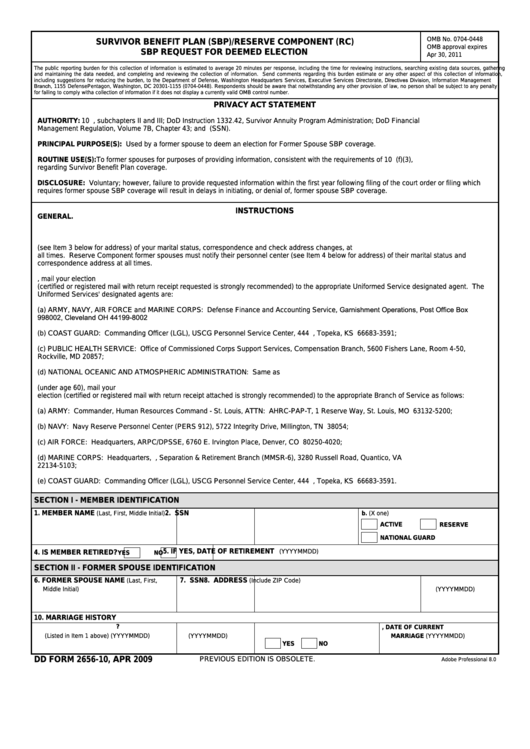 Complete Dd Form 2656-10 - Survivor Benefit Plan (Sbp)/reserve Component (Rc) Sbp Request For Deemed Election - April 2009 with your personal data - all interactive fields are highlighted in places where you should type, access drop-down lists or select multiple-choice options. Management Regulation, Volume 7B, Chapter 43; and E.O. 9397 (SSN). regarding Survivor Benefit Plan coverage. requires former spouse SBP coverage will result in delays in initiating, or denial of, former spouse SBP coverage.